All of life on a 3x5. ...is *so* going to win. (optional) 2 cans pinto beans, drained and rinsed. You can use kidney beans if you prefer. Chop up onions and garlic fine in a food processor. In same pan, lightly brown the ground chuck. Add to dutch oven. Stir all spices into the meat and onion mixture. Heat through, stirring every so often to prevent any burning. In food processor, blend hot chili(s) and sun-dried tomatoes until they make a paste. Add a little olive oil from the tomato jar if needed. Dump can of tomatoes into food processor with chili paste, blend until tomatoes are chunky. Pour tomato mixture into meat mixture. Add a cup of water. Stir well. If desired, add cans of pinto beans at this point. Simmer an additional 30 minutes. Consider some of the following variations. If you like a meatier chili, use a 14 oz can of tomatoes and/or omit sun-dried tomatoes. If you like it hotter, add more fresh peppers and toss in some cayenne. For a slight mole overtone, stir in 1 oz. unsweetened baking chocolate. Use red wine or beef stock instead of water for a richer taste. Saute the chuck in some pan drippings from smoked bacon for a smokier taste. Remember - chili is always better the second day! The fires are still burning and dangerous, but not the enormous threat they were earlier this week. The biggest safety concern for the county now is air quality, or rather the lack thereof. I'm pretty miserable at the moment. Overall, the way the disaster was handled has been viewed favorably. We are still understaffed on firefighters and equipment (no taxes, no budget, no equipment), but the fire was fought strategically with what was available and damage was less than it could have been. One of the loopier ideas put forth during the fires was from the much reviled City Attorney, Mike Aguirre. He said the entire county should have been evacuated except for essential personnel. At base, it is a logical proposition, but the prospect of moving several million people out of the county with a few hours notice is simply impracticable under perfect conditions, let alone when the major transit routes out are blocked by fire and or hurricane force winds. I discussed this with one of my co-workers yesterday, an older gentleman. He was digusted by Aguirre's proposal, thinking it just a bid for attention. "Logistics," my co-worker said, "it all comes down to logistics." And here is where the conversation became interesting. "Like Iraq," he said, "you need to plan to get out. And no one has an exit strategy. They didn't have one, and we shouldn't have been there in the first place." That perked up my ears, so I pressed a little bit. It was clear that my co-worker's sympathies did not lie with the anti-war left, but neither was he supporting the administration. His concern was for the military troops and getting them safely out of Iraq. He knew you can't just pick up and leave, not if you want living soldiers and functional equipment. Why is this significant? It shows what is probably a majority US opinion - do what it takes to get our troops Iraq with the least possible harm to them. Other issues just didn't matter, and could be dealt with later. All political sides need to take cognizance of this stance. Ordinary people don't want to leave Iraq for ideological reasons. They have nothing vested in that. They measure the price of Bush's war in US soldiers maimed and killed, and wish to keep it low. Thus, the winning argument will have the most coherent withdrawal plan, putting the safety of the soldiers front and center. It allows you to see where the fires are in relation to each other, their relative size, and their rate of spread. They also give some information about how containment is going. Recent reports are saying it will be next week at the soonest before there is full containment of the Witch and Harris fires. They will be extinguishing them into December. Here you can find some incredible relief maps of the world, including a knock out focus on the US. There are also a bunch of articles and resources for cartographers who do relief maps. Since Sunday, the Witch Creek and Harris fires already have destroyed more than 700 homes and burned nearly 270,000 acres between them. The Rice Canyon fire has scorched another 7,500 acres and is threatening an estimated 400 structures in the communities of Del Luz and northern Fallbrook, according to a spokeswoman for Cal Fire. None of these fires is contained and they continue to threaten homes in both North and East County, as the return of the region's normal onshore airflow may prove to be a mixed blessing. On the western edges of the fires, things are looking up somewhat, in part because the hot, dry, easterly Santa Ana winds are abating, replaced by the normal westerly wind off the Pacific Ocean. Evacuation orders have been lifted for the coastal communities of Solana Beach, Olivenhain and Del Mar, as well as the San Diego communities of Del Mar Highlands, Carmel Valley and Otay Mesa. A portion of Rancho Bernardo also is allowing residents to return to their homes. Further inland, however, those same onshore winds were posing a problem for mountain communities, specifically Palomar Mountain and the historic, evacuated town of Julian. The fire currently is about six to eight miles from Julian, but that distance is closing, said Rick Hutchinson, Cal Fire's deputy incident commander for the Witch Creek fire. Once the onshore winds return in force Wednesday afternoon, the fire's push toward Julian could pick up speed, he said. The nearby communities of Wynola and Pine Hills also are under threat, he said. That same onshore flow is threatening to turn the Harris fire on homes along state Route 94 in Jamul and Jamacha, according to Cal Fire. Further, those onshore winds could reignite some hotspots in areas already burned over, reviving fires in areas that places that now may look safe, firefighters warned. Ironically enough, wind from the ocean will decrease air quality becuase it will trap the smoke onshore instead of rushing it out to sea the way the Santa Anas did. The best news sources are still the Union Trib blog and the KPBS Twitter feed. No solid news coming from the north or east about the Witch fire. Now it is uncertain if it actually connected to the Poomacha fire. That may seem odd that officials don't know if two fires connected, but consider that much of the reporting was done in early morning hours, the smoke is awful, the terrain is incredibly steep and rugged, and the fires jump around so its not always possible to know what patch of flames came from which parent fire. The two fires are big, they are close, they are not contained and they are dangerous as all hell. 'Nuf said. The Harris fire is whipping around, too. Jamul proper is probably safe, but the area almost due east (Skyline Truck Trail/Lyons Valley/Honey Springs intersection)has been hard hit, with an unconfirmed estimate of 50 homes burned. The greatest concern that I see is the fires in Camp Pendleton are threatening power lines out of the San Onofre nuclear reactor, which is providing the bulk of San Diego's electric power right now. KPBS Twitter just announced that backfires have been set to try to keep the flames away from transmission lines. More and more people are being let back into the evacuation zones. This is not necessarily going to help evacuees. Power, water and gas service is out in a number of these areas, a good number of houses have burned down (over 1,000 by most counts), and the places may not be habitable. Areas that are well outside the burn zones, such as Chula Vista and Del Mar, should be fine, but Rancho Bernardo, Poway, Scripps Ranch, Rancho Santa Fe, and areas may be safe from fire without being completely habitable. At least people can check their homes and pick up stuff they may need for the next few days until utilities are restored. Still off limits are Ramona, much of Escondido, all of the San Pasqual Valley, Julian, the SR 67 corridor, the greater Jamul area, everywhere along SR 94 to the border and further east, Fallbrook, parts of Camp Pendleton, Palomar Mountain, Spring Valley, and just about anywhere downwind (east) of the major fires. Here are two PDF maps with some excellent commentary. I snagged them from the SD Union-Tribune site. They have lines to show how much and where was burned each day. I would be remiss if I didn't give a shout out to our next door neighbors. Mexico has been supplying 10% of San Diego's power needs since one of our major lines through south county went down yesterday. They have also sent several dozen fire fighters to battle the Harris blaze. These guys helped keep the southern edge of the blaze under control (and away from Tecate), freeing the US fighters to concentrate on the western blaze that threatened Chula Vista. They've been recalled back to Baja because of fires of their own. I got a call @ 6:30 AM from my company's emergency notification system not to come in. The air quality is getting worse. My eyes and nose are stinging from the smoke in the air and I'm coughing up stuff in technicolor. Outside, the air is murky, like a miscolored light fog has settled in. Looking south from the front window, I can see the smoke from the Harris fire blowing out to sea. The good news is that the winds are definitely letting up. Forecasters are saying that they should be back to normal by this evening, though that still leaves temperatures in the 90s and tinder-dry conditions around the county. Also, it looks like both the Witch and Harris fires have stopped expanding west. The latest SD County burn map shows significant active burn areas along the western edges of the the fires, especially the Harris blaze. Cross referencing the County PDF with the KPBS Google map, there look to be active burns very near the Salt Creek Golf Club and a long fire front due east of Otay Lakes. Jamul and Rancho San Diego are very close to a major active burn and one of the evacuation centers is threatened. In the Witch fire, there are active burns in Rancho Santa Fe - one of the most pricy patches of real estate in the entire US - and a nasty sting of active spots along the north shore of Lake Hodges. There are scattered active burns around the north end of the El Capitan Reservoir. Very bad news - the Witch fire has turned east and is burning out of control. I said last night that it looked like it was going to merge north with the Poomacha fire and it did just that. The combined fires are over 200,000 acres. SR 67 has been closed and there is a large active burn zone between it Lake Poway and Lake Ramona. Another band of active burn reaches from SR 78 in the south up to Lake Wohlford in the north and then arcs through the area, reaching east but staying above Sutherland Lake. It doesn't quite reach SR 79. Valley Center is being evacuated. Another band of active burns runs from SR 78 due south to the McCoy fire, though that fire has been contained. That has forced the total evacuation of Julian to Borrego Springs. New fires have expanded on the Camp Pendleton Marine base, closing I-5 temporarily. Southbound traffic has been restored. The Rice Canyon fire is 10% contained, but still forcing evacuations. With the winds dying down, they can finally use aircraft to dump water, chemicals and other things to slow down the leading fire edges as well as scope out the burns better and stay ahead of the spread. The fire crews are beyond exhausted. KPBS Google map of burn areas. A good one to see burn zones vs. evacuation zones, and with helpful comment bubbles. Updated more often than most of the others, too. Try viewing it with the "Hybrid" view which provides a good sense of the topography. It looks like the winds have relented and/or shifted enough to halt the westward expansion of the fires. This spared the coastal areas of Del Mar, Solana Beach and Encinitas in the north, and the city of Chula Vista and the southernmost reach of the City of San Diego in the south. People have been warned to stay on alert for evacuations in those areas (particularly the south county locations), but it's not likely. Some areas immediately south of the Witch fire, Poway and Carmel Valley, are also allowing people back in. All of these will help relieve the burden on evacuation shelters. Less good is the uncertain information about the fires in Rice Canyon and near Mount Palomar. The Rice Canyon one has no containment and could spread a number of directions depending on the wind, while the Poomacha/Mount Palomar fire is estimated at 23,000 acres and may be merging with the northern edge of the Witch fire. People east of the fire zone, in Julian, are being warned to prepare for evacuation, which will be very difficult because of how remote that area of the county is. People are being told to go to Borrego Springs, in the desert due east. The most worrisome area remains the narrow, nearly inaccessible strip of land that lies in between the southernmost reach of the Witch fire and the northernmost extent of the Harris fire. SR 67 has been evacuated between Ramona and Lakeside, and northern Jamul and parts of Rancho San Diego are likewise being evacuated. The very latest reports are heartening because it sounds like the Harris fire may be running out of steam and not pressing north. The latest feed from the Union-Trib is that over 500,000 people in San Diego County are under mandatory evacuation orders. I'm home today. All non-essential personnel were sent home from my office. About half of my co-workers are either under evacuation orders or getting ready to evacuate. People are being asked to stay off the freeways, not use their cell phones, and reduce all extra power usage. The Harris fire is moving west and north, leaving the more sparsely populated border region for some dense middle class suburban areas at the edge of San Diego proper. The Witch fire is snaking around the upper class suburbs north of San Diego, also getting pushed north and west by the winds. There is not a hotel room to be had between the Mexican border and Irvine, up in Orange County. The evacuation centers are filling and a number are full. While most people will be able to return to their homes eventually, it is going to be days at best before the burn areas are safe. Hundreds of residences have been destroyed. State, regional, county and municipal officials have been working diligently for years to be ready for catastrophic fire events, and their planning is paying off. The reverse 911 calling (where 911 calls you to warn you of trouble) was something my company helped implement and is being widely credited with getting people out of fire zones in a timely manner. Local shelter locations have been scoped out for some time. We're having a few issues with food and bedding at the locations. The really bad news that just showed up the news feeds is that the Santa Ana winds are expected to keep blowing through Thursday, which pretty much means there won't be any effective fire fighting until Friday. Fingers are crossed that the winds will lose force, if not direction, before then. We're sitting inside of an arc of fire. Crews are trying to keep the northern Witch fire from joining up with the southern Harris fire through the back country. We haven't yet hit the destruction levels of the Cedar fire in terms of acres burned, buildings destroyed or (thank goodness) people killed and injured, and let's hope it stays that way. It really looks like the Witch fire will burn through all the way to the ocean at Del Mar. If the winds keep up, the Harris fire may do the same in Chula Vista. All hotels are full in the area, shelters are almost full, and people in evacuation zones are being told to head to Orange County for safety. Just a quick note to say that we're all safe here at Casa Anglachel. Two of the current fires are close enough to where we live that the air in the apartment is smoke-scented and outdoors we're wreathed in a yellow haze. The "Witch" fire is north, almost exactly between the two large Paradise and Cedar fires of October 2003. At last report, it had burned over 4,000 8,000 acres. There is another fire south and east of us, very close to the US-Mexico border, called the "Harris" fire. That is the one where one person was killed and eight have been injured. It is reported to have burned about 3,000 acres. Both of these areas are rough, rocky and mountainous. While the Cedar fire got most of the news last time, there was a south county fire like the Harris burning then, as well. Most pictures from the region are on the Malibu fires because they are destroying a lot of houses and because they are right near LA and media centers. I suspect the San Diego County fires will be worse because there are no natural barriers to their spread. Ironically enough, the biggest help to keeping the Witch fire under control will be that the Cedar and Paradise burned down so much four years ago, there's not that much left there to catch fire. We are well away from both blazes and will not be in any danger from them. The concern for us is air quality. I have a horrible head cold, so am congested already, and it's a little difficult to breathe comfortably. I will be very thankful for the AC at work tomorrow. EDIT - Better San Diego news from the San Diego public news station KPBS. Better fire map here. Being green is being pet friendly. When we received a shipment of sink faucets, little did we know that we would also get a great cat toy. 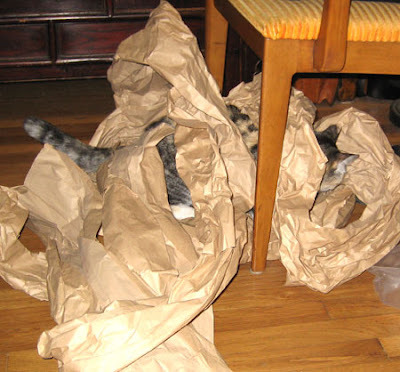 Instead of those annoying and environmentally hazardous plastic packing peanuts, our shipment was padded with lengths of crumpled brown paper. The cat took one look at this and said "MINE!!!!!!!!!!!!" 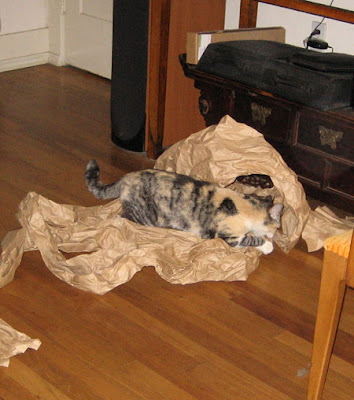 She jumped on it, she bit and clawed it, she tunneled through it, she shoved it all around the living room floor. This was the best kitty toy evah. 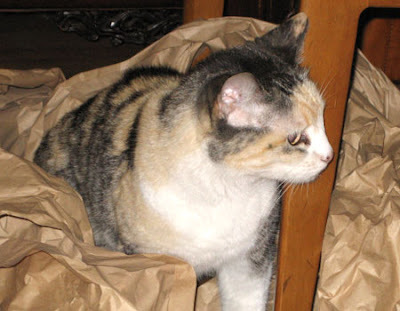 How can you improve on yards and yards of crackling brown paper? Throw in an extra cardboard box. It is three days later and she is still playing with this. 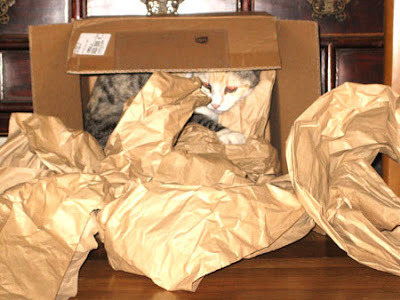 The box is her cave, and she merrily romps through the paper every few hours. Which way is the woman turning? I can see her spin both directions, but I mostly see her turn clockwise (i.e., right-brain), which totally shocks me, given that I think I'm better described by the left-brain function list. Al Gore won the Nobel Peace Prize for his work on behalf of every human being on the planet. He is donating all proceeds of the award to the Alliance for Climate Protection. Compare the service this man has given to his country and world to the venality and barbarity of George W. Bush. We don't have to wait for history - the world has already judged Shrub to be a failure and a disgusting, petty, puerile little man. Elect a president who has a freaking clue about foreign affairs and international law. That means Edwards, Kucinch and Gravel are out. Period. Not even VP material. Elect as large a majority in Congress, particularly the Senate, as we can get to keep the Rethugs sidelined. The prospects are looking better by the day. If we want any hope of help on extricating ourselves from Bush's war without having our military destroyed in the process, we have to show that we're serious about upholding the Geneva Conventions and destroying Cheney's imperial framework. Otherwise, we'll be left to our own increasingly isolated and powerless devices. Failure to do so, and we will get what we deserve. Rejection of the Cheney doctrine is the first step to the refoundation of the republic.